Time to come out of hibernation. I have been slack for the past three months - not only has it been winter - we have been waiting eight months for a start on our extension next to the veggie garden. One of the holdups was that it was just too wet to get any equipment onto the site, but last week it finally happened. Concrete sawn, concrete removed (above), and now a new slab has been laid. By next month's report, we should have a serious garden shed (and extended living). And a bit more shade on the veggie garden - can't have everything. So, here we go. 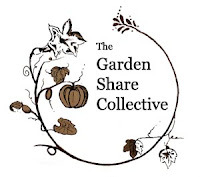 It is that time of month again, when gardeners across the country, and across the world, report on their activities, as part of the Garden Share Collective. This is kindly hosted by Liz at Strayed from the Table. One of the really good things about these reports is that I can now look back at the one for the same time last year - and I am definitely ahead with my plantings. Which may be because my Beloved has looked at climate records for the last few years, and promised me that there were no frosts recorded here in September. I even found there were very frosts at all this year - one on April 25th, and several in August, but that was it. Bit of a worry. Here in my Gippsland (southern Victoria) garden, this is the last time I will be able to take the same shot from the back step. The two front beds had various manures (sheep, horse) dug in at the start of winter, and have sat there under folded shade cloth for three months. Digging them over, the worms are stunning. This is my major experiment for this year - two cheap Bunnings arches (one I already had) and some very fine black bird mesh (hopefully little wind resistance) and we have a bird-proof tomato house. Will be interesting to see how it goes. About a month ago, Grosse Lisse, Roma and a single cherry tomato went in there. Still needs a few more stakes on the Romas though. The net is getting hard to find - Bunnings have discontinued it. Already in - seedlings of Grosse Lisse and Roma tomatoes, one cherry tomato. 2 x capsicums(orange, and a pimento - more to come), pus the tomatoes. Pumpkins (four combo seedlings) potted on, Greek pumpkin seeds planted. Haven't tried them before. Celery- months ago, before winter, I put the base of a bunch of celery in a bowl with a little water, until it developed small roots. It went out into the garden, where it just sat. Suddenly, it is moving and starting to look like real celery. So, celery being a gross feeder, I have tried some Sulphate of Ammonia, and I will see what happens. Broad Beans - I have the usual problem with them being too tall - they may not be in there much longer, as they are shading the garlic. I'm off to lurk to see what others have been doing as they post. I love the idea of the arches. I look forward to seeing how it goes. It's fantastic to see the development of your shed/outdoor area. earthmoving equipment - now that is serious gardening work. i'm impressed. love the arches - i'm tempted to steal that idea for my tomatoes! You're ahead of me with the seeding, very productive! Hope the new patch turns out well. Wow you have been busy, and huge equipment in your bakcyard - wow this is serious. I look forward to seeing what you have been doing..... Dont you just love worms :) I get so excited when I see a load of worms. Great to have you back. Your backyard is going to be different next month. I like the idea of your arches, we need to build something similar for our tomatoes this coming fruit fly season. Also is there a dragon hanging in there?